Can Self-Driving Buses Prevent Motor Vehicle Accidents? > Auto Accident > Driver Negligence > Can Self-Driving Buses Prevent Motor Vehicle Accidents? Tesla Motors Inc. is reportedly working on a self-driving bus that would supposedly put drivers out of work and provide public transportation to the masses. Are Self-Driving Buses the Future of Public Transport? Musk says he’s committed to solving the high-density urban transportation dilemma. Autonomous vehicles, which could help reduce traffic congestion, may even be the key to reducing traffic crashes and saving lives. Interestingly, Musk is not the only heavy-hitter working on developing a self-driving bus. Billionaire Warren Buffett is also reportedly working on a prototype for an electric, self-driving bus that he intends to roll out in some Northwest cities. Mercedes-Benz Actros big-rig fitted with a Daimler “highway pilot” operating system made a 15-mile trip from Denkendorf to Stuttgart, Germany following Highway A8, which stayed in its lane and maintained a safe speed and distance from regular traffic. China manufacturer Yutong announced that it has created an autonomous bus that managed to traverse through 26 traffic lights, as well as make several lane changes and pass one other vehicle, over the course of a 20-mile journey between Zhengzhou and Kaifeng. Technologies believed to be used in autonomous vehicles include lasers, radar, and camera systems on every side of the vehicle. Google’s vehicles are said to have logged up to 1 million hours of public road time. Google’s autonomous technology is said to be so complex that it can even understand hand signals from cyclists. Audi’s A7 prototype drove 500 miles without any manual input from humans. By 2017, Sweden is expected to have nearly 100 autonomous vehicles driving on the roads (in “test” mode) to evaluate how well they perform in traffic (when sharing the roads with human drivers). Saving lives (via preventing fatal wrecks). In 2013, there were 280 buses involved in deadly accidents, with these crashes causing 310 deaths. Nearly 4,000 people die each year in collisions involving trucks. According to a study released in 2009, 71 percent of large truck crashes involved some kind of distracted driving. Autonomous vehicles can prevent distracted driving practices (and wrecks), as these vehicles won’t be operated by a driver who is texting, smoking, talking on the phone or otherwise not paying attention to the road. 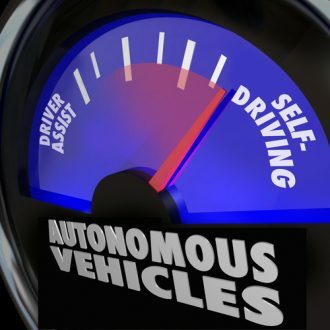 Autonomous vehicles will not get fatigued, agitated or aggravated to the point of road rage. They also won’t operate underr the influence of alcohol. If you have been injured in any type of car accident, contact a trusted Littleton car accident lawyer at Bahr, Kreidle & Flicker by calling (303) 794-7422 or by emailing us using the contact form on this page.